* First Author. Dept. of Medical IT, & Marketing, College of Health Industry, Eulji University, Korea. This study investigated effects of five consumption values of family restaurants, that is to say, functional value, economic value, social value, creative value and emotional value, upon consumers’satisfaction and brand reliability, and effects of satisfactions upon brand reliability, and effects of satisfaction and brand reliability upon consumers’ behavioral intention to help develop family restaurant industry. Frequency analysis was done. The interviewees had demographic characteristics of gender: 156 men (54.4%) and 131 women (45.6%). The interviewees live in the places: 136 persons (47.4%) in Gyeonggi and Metropolitan area, 57 persons (27.0%) in Gangbuk, Seoul, 38 persons (13.2%) in other areas in Seoul, 34 persons (11.8%) in Gangnam, Seoul, 18 persons (6.3%) in Incheon and 4 persons (1.4%) in other regions. Values of the use of family restaurants, for instance, functional value, economic value, social value, emotional value and rarity value had influence upon satisfaction and brand reliability, had influence upon satisfaction as well as brand reliability. This study investigated consumption values of which consumers thought much, effects of consumption values upon satisfaction and brand reliability, effects of consumer’s satisfaction upon brand reliability, and consumer’s satisfaction and brand reliability upon behavioral intention, and to verify effects having influence upon local and foreign family restaurant. JEL Classifications: L81, L89, M30, M31, M39. In the last ten years, the Koreans often ate out owing to higher income, better living level, more leisure time and women’s entry in public affairs to expand and grow dining market quickly, so that food service industry has become promising. Family restaurant industry has also expanded quickly to increase various kinds of home and foreign brands. Foreign family restaurant brands had occupied most of domestic family restaurant market in the past: Growth of family restaurant industry area has produced various kinds of domestic family restaurant brands to compete each other. Even if those businesses have made efforts to differentiate product prices and quality, food service industry had almost no technical gap between businesses to be equalized. Investigation into reason why consumers visited family restaurant and what values made consumers select family restaurant was needed considering current situation of family restaurant. This study investigated effects of five consumption values of family restaurants, that is to say, functional value, economic value, social value, creative value and emotional value, upon consumers’ satisfaction and brand reliability, and effects of satisfactions upon brand reliability, and effects of satisfaction and brand reliability upon consumers’ behavioral intention to help develop family restaurant industry. At satisfaction, consumers have been compensated either properly or improperly from sacrifice from cognitive point of view (Howard & Sheth, 1969). Satisfaction was said to be psychological state after experiencing products and/or services of enterprise with static and/or continuous emotion (Oliver, 1980). In other words, satisfaction means emotional reaction to the experience of product and/or service bought, retailer, shopping and/or purchasing behavior (Westbrook, & Reilly, 1983). Therefore, satisfaction that consumers feel satisfied with service and/or product to have affirmative emotion is said to be subjective emotion. Satisfaction that is important factor of relationship management is index to forecast consumers’ future behavior. (Grace & O'Cass, 2005). 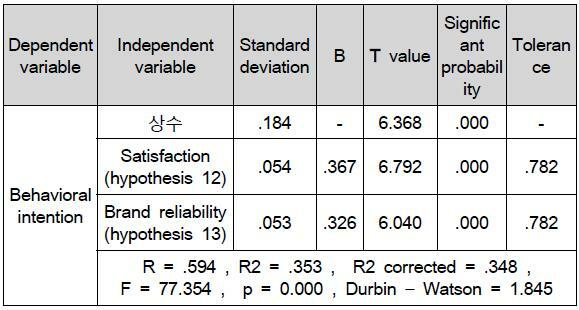 A lot of papers investigated satisfaction (Lee & Bea, 2006; Kang et al., 2011; Koo, 2005; Yu & Yoon, 2011; Kwon & Yu, 2014). The consumption value has expressed consumers’ basic desire to be used to let consumer do self-realization (Feather, 1975). The consumption value explains reasons why consumers buy and make use of products and/or services, and pursues different values of the same product (Chen & Tsai, 2008; Kang & Chae, 2011) to have the most important influence at consumers’ selection of market and to have powerful and comprehensive influence upon individuals’ cognition of the product. (Ryu, 2002). And, the consumers attain a goal by specific product and/or service to pursue pleasure and experience (Kim & Cho, 2013). A lot of researchers classified consumption values: The consumption values that have influence upon consumers’ buying behavior have functional, practical and physical attributes, and they have relations with functional values, social group and economic position that have influence upon customers’ selection behavior, and have relations with social values, fear, romance and other emotional reaction, affection and comfort and other aesthetic alternative of specific consumption group and/or social classes to include situation values and cognitive values (Sheth et al., 1991), and to have functional value, emotional value, social value and economic values including monetary expenses, time, efforts and other expenses (Sweeney & Soutar, 2001). And, the consumption value included consumer value (Lee & Yang, 2012). This study classified consumption values into five, that is to say, functional value, economic value, social value, creative value and emotional value. H3 : Social value has positive influence upon satisfaction. H4: Creative value has positive influence upon satisfaction. H5: Emotional value has positive influence upon satisfaction. The brand reliability was said to be customer’s belief that brand is able to do a function (Chaudhuri & Holbrook, 2001). The brand reliability was defined to be customer’s belief that brand might give customers the highest profit based on goaland/or value shared of both customers and enterprises (Blackston, 1992). The brand credibility was said to give credibility by brand entity from point of view of professionalism, reliability and good impression (Keller, 1993). The reliability combines customer’s loyalty so that brand reliability is very much important to control customers successfully (Kim et al., 2014; Hwang & Shin, 2012; Kim et al., 2012; Kim et al., 2011). H6: Functional value has positive influence upon brand reliability. H7: Economic value has positive influence upon brand reliability. H8: Social value has positive influence upon brand reliability. H9: Creative value has positive influence upon brand reliability. H10:Emotional value has positive influence upon brand reliability. Customers who were satisfied with products and services after making use of specific brand might have attitudes and reliability on products and services. The satisfaction had affirmative influence upon both credit and goodwill of the reliability under offline retail environment (Walsh et al., 2010). Customers who were satisfied with specific brand might have more brand reliability at higher affirmative satisfaction on credit and goodwill. H11: Satisfaction has positive influence upon brand reliability. Consumers who were satisfied or dissatisfied after experiencing commodities might take actions after buying (Hawkins et al., 2007). Consumers who were satisfied with values cognized might take actions, for instance, increase of times of the use, recommendation, repurchase, preference of the commodity and words-of-mouth. Other studies on behavioral intention were Kang et al. (2013) and Yang and Shim (2013). In this study, satisfaction and brand reliability had influence upon behavioral intention based on reuse intention, use together with friends and/or relatives, active and affirmative recommendation intention, and recommendation intention at application to recommendation of the intimates. H12:Satisfaction has positive influence upon behavioral intention. H13: Brand reliability has positive influence upon behavioral intention. This study investigated effects of customer satisfaction and brand reliability upon behavior intention based on reuse intention, use together with friends and relatives, positive and affirmative recommendation intention, and recommendation intention at application to recommendation of the relatives. The study investigated effects upon selection of the stores by questionnaire survey seven days from October 1, 2014 to October 8, 2014: The subject was many and unspecified consumers who visited family restaurants. Preliminary investigation verified validity and then main investigation was done based on the material. The authors collected 289 copies among 300 copies, and finally made use of 287 copies after excluding copies having errors such as partial omission of fill out and unfaithful answers. Frequency analysis was done. The interviewees had demographic characteristics of gender: 156 men (54.4%) and 131 women (45.6%). The interviewees live in the places: 136 persons (47.4%) in Gyeonggi and Metropolitan area, 57 persons (27.0%) in Gangbuk, Seoul, 38 persons (13.2%) in other areas in Seoul, 34 persons (11.8%) in Gangnam, Seoul, 18 persons (6.3%) in Incheon and 4 persons (1.4%) in other regions. 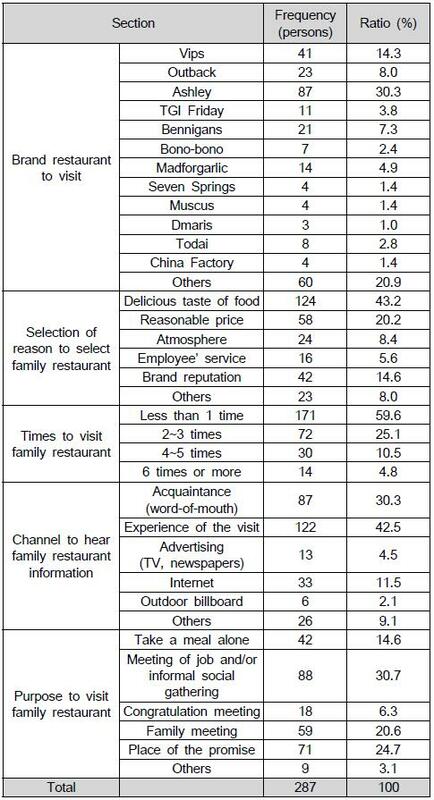 The interviewees selected family restaurants considering delicious taste of food (124 persons, 43.2%), followed by price (58 persons, 20.2%) and brand reputation (42 persons, 14.6%), and those three reasons occupied more than 78.0%. The interviewees got information of family restaurant by experience of the use (122 persons, 42.5%), and acquaintance (words-of-mouth) (87 persons, 30.3%), and those two reasons occupied 72.8%. Residents in Gyeonggi-do and Metropolitan area occupied 136 persons (47.4%), and the ones in Gangbuk, Seoul did 57 persons (27.0%), followed by other regions in Seoul (38 persons, 13.2%), Gangnam, Seoul (34 persons, 11.8%), Incheon (18 persons, 6.3%) and other areas (4 persons, 1.4%) in order. Factor analysis upon family restaurant classified factors having influence upon satisfaction and brand reliability into five, that is to say, functional value, creative value, emotional value, social value and economic value. Those factors were evenly distributed to have even characteristics. 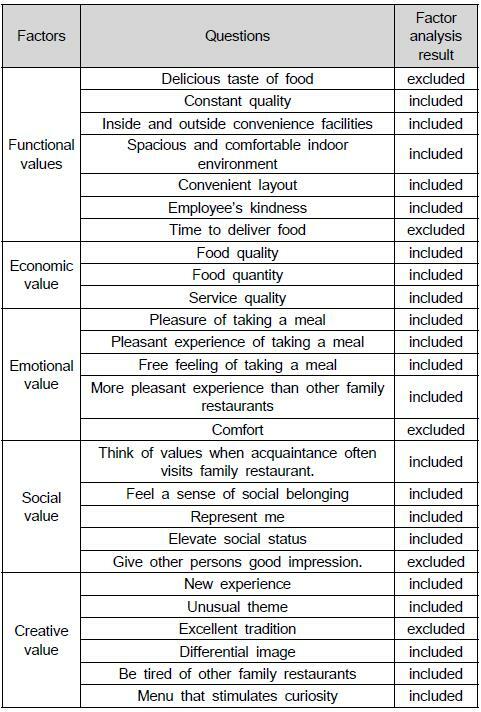 Family restaurant users had value factors of satisfaction to have the highest factor of functional value, followed by emotional value and economic value in order. Values did not vary much between value factors. The interviewees who had visited family restaurant wanted to visit together with acquaintance, family members and acquaintance and/or to recommend the restaurant to them, and wanted to visit again less despite revisit intention. Hypothesis 1 was adopted: Functional value had positive influence upon satisfaction with use of family restaurant to be significant (0.01), and t of 4.451. Hypothesis 2 was adopted: Economic value had positive influence upon satisfaction with use of family restaurant to be significant (0.01), and t of 4.149. Hypothesis 3 was adopted: Social value had positive influence upon satisfaction with use of family restaurant to be significant (0.01), and t of 4.208. Hypothesis 4 was adopted: Creative value had positive influence upon satisfaction with use of family restaurant to be significant (0.01), and t of 5.846. Creative value had the greatest influence among experiential values. However, hypothesis 5 was not adopted: Emotional value has positive influence upon satisfaction with use of family restaurant to be significant (0.01), and t of -2.257. Emotional value had no influence upon the satisfaction to differ from expectation. 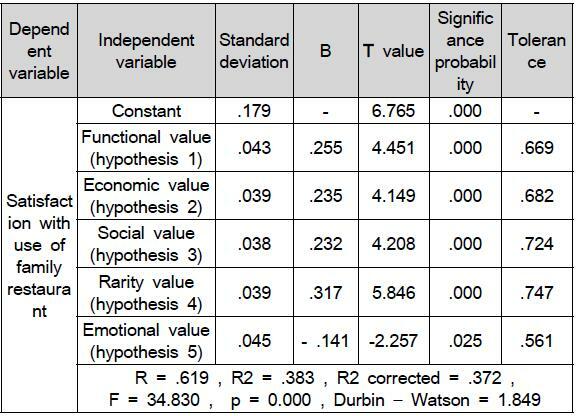 Hypothesis 6 was adopted: Functional value had positive influence upon brand reliability to be significant (0.05), and T value of 2.409. 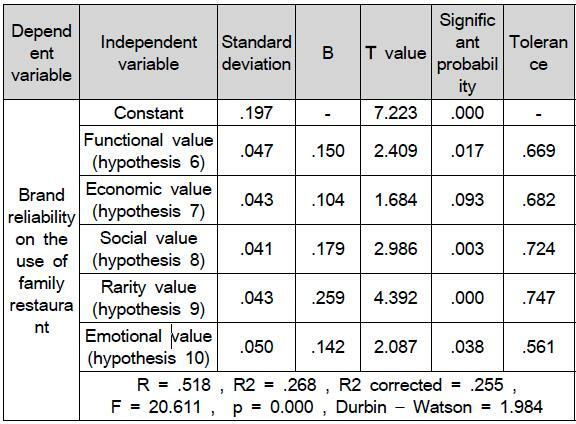 Hypothesis 7 was adopted: Economic value had positive influence upon brand reliability not to be significant (0.01 and 0.05), and to be significant (0.1), and T value of 1.684. Hypothesis 8 was adopted: Social value had positive influence upon brand reliability to be significant (0.01), and T value of 2.986. Hypothesis 9 was adopted: Creative value had positive influence upon brand reliability to be significant (0.01), and T value of 4.392. Creative value had the greatest influence among experiential values. 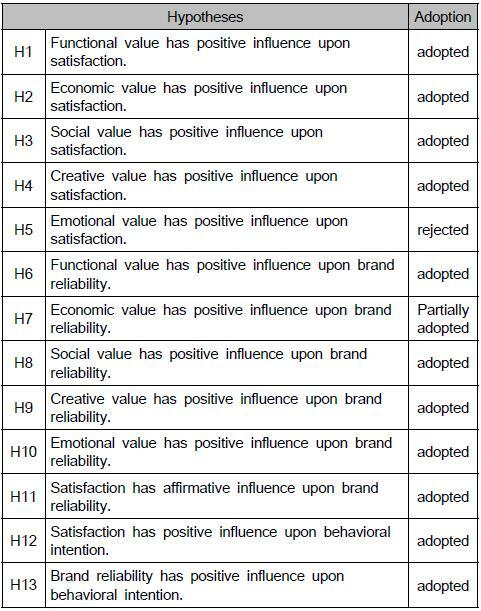 Hypothesis 10 was adopted: Emotional value had positive influence upon brand reliability, and T value of 2.087. Restaurant users’ satisfaction had influence upon brand reliability. Hypothesis 11 was adopted: Family restaurant users’ satisfaction had positive influence upon brand reliability to be significant (0.01), and T-value of 8.918 that was very much high. Hypothesis 12 was adopted: Satisfaction of the use of family restaurant had positive influence upon behavioral intention to be significant (0.01), and T value of 6.792. Hypothesis 13 was adopted: Brand reliability had positive influence upon behavioral intention to be significant (0.01), and T-value of 6.040. T-value had more influence upon behavioral intention than brand reliability had. 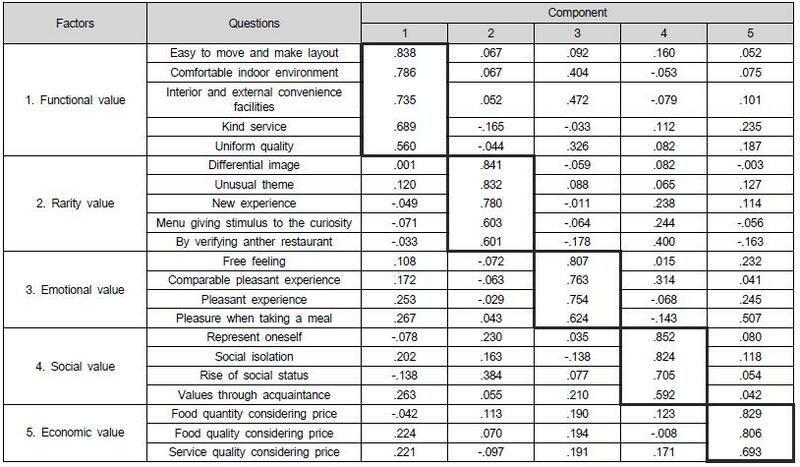 Hypotheses 1 to 4 were: Importance of use value of family restaurant was high (0.01), and high satisfaction of four kinds of experiential use value had high satisfaction of the use. The use value consisted of functional value, economic value, social value and creative value. Hypothesis 6 to 10 except for hypothesis 7 were: Importance of use value of family restaurant was high (0.01), and high experiential use value had high brand reliability. Hypothesis 11 was: Satisfaction with family restaurant use had the largest positive influence upon brand reliability (0.01). Hypothesis 12 was: Satisfaction with use of family restaurant had positive influence upon behavioral intention (0.01). Hypothesis 13 was: Brand reliability of use of family restaurant had positive influence upon behavioral intention. Hypotheses 12 and 13 were: Behavioral intention was influenced by brand reliability more than by satisfaction with use of family restaurant. In the last ten years, frequency of eating out increased at change of social atmosphere to expand scale of food service market and to increase family restaurant industry quickly and to let local and foreign family restaurant brands compete fiercely each other. This study investigated consumption values of which consumers thought much, effects of consumption values upon satisfaction and brand reliability, effects of consumer’s satisfaction upon brand reliability, and consumer’s satisfaction and brand reliability upon behavioral intention, and to verify effects having influence upon local and foreign family restaurant. Hypothesis is: Functional value, economic value, social value and creative value have positive influence upon satisfaction. The hypothesis was adopted. Creative value was found to have the greatest influence upon satisfaction. Local and foreign family restaurant brands should elevate creative values at keen competition of brands to improve customers’ satisfaction. Hypothesis is: Hypothesis of economic value has influence upon satisfaction has been partially adopted. And, hypothesis of remaining values such as functional value, social value, creative value and emotional value have positive influence upon brand reliability has been adopted. And, creative value had the greatest influence upon satisfaction. 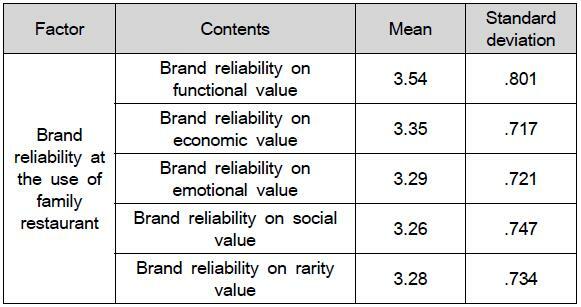 However, five values such as functional value, social value, creative value, emotional value and economic value had influence upon brand reliability. In other words, many factors had influence upon brand reliability, and even one of the minor mistakes could have serious impact upon brand reliability. Creative value had the greatest influence so that brand’s image and/or differential impression had great influence upon brand reliability. So, each brand business needed to have differentiated image strategy of the brand. 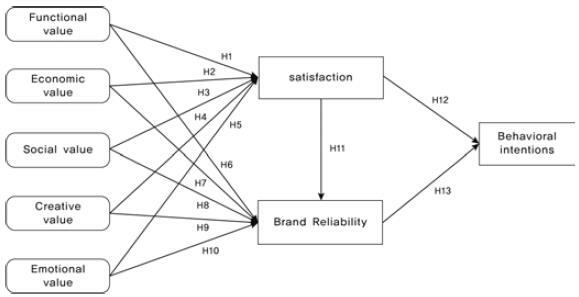 Lastly, satisfaction had positive influence upon brand reliability, and not only satisfaction but also brand reliability had affirmative influence upon behavioral intention. So, not only satisfaction but also brand reliability had influence upon behavioral intention so that satisfaction was thought to be very much important factor. This study had limitations, and further studies are needed. First, the subject was in their twenties and thirties and should be expanded up to the fifties and sixties to overcome limit of generalization. Second, the study had five kinds of consumption values, that is to say, functional value, economic value, emotional value, creative value and social value. 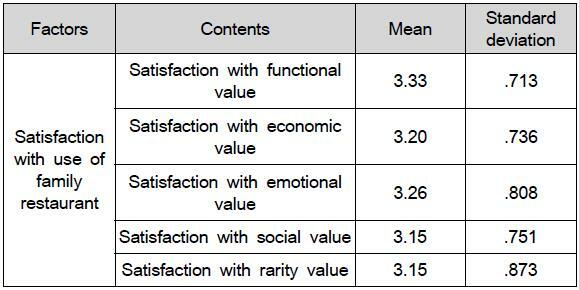 But, many researchers classified consumption values into various kinds of values in addition to the five values. So, the five kinds of values made limited research. Further studies should be made to research widely and deeply from various kinds of views. Blackston, M.(1992). A brand with an attitude: a suitable case for treatment. Journal of the Market Research Society, 34(3), 231-241. Chaudhuri, A., & Holbrook, M. B. (2001).The Chain of Effects from Brand Trust and Brand Affect to Brand Performance: The Role of Brand Loyalty. Journal of Marketing, 65(April), 81-93. Cho, Hyun-Jin(2014). The Effects of Consumption Value on Satisfaction and Loyalty: Focusing on Chinese Smartphone Users. Journal of Distribution Science, 12(8), 123-132. Chen, C. & Tasi, M. (2008). Perceived Value, Satisfaction and Loyalty of TV Travel Product Shopping: Involvement as a Moderator. Tourism Management, 29, 1166-1171. Feather, N.T.(1975). Values in Education and Society. New York: The Press. Grace, D., & O'Cass, A. (2005). An Examination of the Antecedents of Repatronage Intentions across Different Retail Store Formats. Journal of Retailing and Consumer Services, 12, 227-243. Hawkins, Del l., Mothersbaugh, David L., & Best, Roger J.(2007). Consumer Behavior: Building Marketing Strategy (10th Edition). New York, NY: McGraw Hill. Howard, J.A., and Sheth, J.N. (1969). The Theory of Buyer Behavor. New York : John Wiley & Sons. Hwang, Hee-Joong, &Shin, Seong-Ho(2012). Impact of a Brand Image Matching with the Advertising Model on Price Fairness Perceptions: Focus on Sports Advertising. Journal of Distribution Science, 10(3), 43-50. Kang, Ho-Gye, Song, In-Am, & Hwang, Hee-Joong (2013). Influence of the Education Service Quality and Result Expectations on Behavioral Intention: Focus on the TOEIC Business of a Global Company. Journal of Distribution Science, 11(2), 71-81. Kang, Kye-Young, Song, In-Am, & Hwang, Hee-Joong (2011). An Influence of the Satisfaction on Factors related to Educational Services sales of Re-registration and the Word of Mouth. Journal of Distribution Science, 9(3), 15-23. Kang, Sung-Bae, & Chae, Mi-Hye (2011). A Study on the Perceived Value and Adoption Behavior of the Smartphone Application. Journal of Internet E-Commerce, 11(4), 187-208. Keller, K. L. (1993). Conceptualizing, measuring, and managing customer-based brand equity. Journal of Marketing, 57(1),1–22. Kim, Hyun-Kyung, & Cho, Hyun-Jin(2013). The Effects of Consumption Value of Smartphone Users on Relational Factors and Repurchase Intention. Journal of Distribution Science, 11(4), 73-80. Kim, Deok-Hyeon, Ha, Ji-Young, Lee, Seung–Hyun, & An, Wook-Hyun(2014). Mediation of Production Trust on Brand Image Influence on Repurchase Intention for PB Rice. Journal of Distribution Science, 12(8), 83-90. Kim, Sung-Duck, Youn, Myoung-Kil, & Kim, Ki-Soo(2012). A Study of the Effect of Model Characteristics on Purchasing intentions and Brand Attitudes. Journal of Distribution Science, 10(4), 47-53. Kim, Moon-Jung, Oh, Young-Ye, & Kim, Ki-Soo(2011). An Influence of Distributor's Corporate Image on Consumer Behavior Towards PB Products. Journal of Distribution Science, 9(4), 83-91. Koo, Yeoung-Duk (2005). The Effect of the Perception on the Physical Environment in Discount Stores on Customer Satisfaction and Intention. Journal of Distribution Science, 3(2), 29-56. Kwon, Yong-Deok, & Yu, Jong-Pil(2014). Effects of the Support and Control of Franchisors on Franchisees' Satisfaction and Response Strategies. Journal of Distribution Science, 12(8), 43-54. Lee, Joung-Gun, & Bea, Mu-Eun(2006). The Impact of Interpersonal Relationships on Department Stores Customer Satisfaction and Trust, Loyalty. Journal of Distribution Science, 4(1),27-52. Lee, Young-Chul, & Yang, Hoe-Chang(2012). The Effect of College Students' Perceived Choice Attribute of Traditional Market and Relationship Quality: Moderating Effects of Consumption Emotion and Mediating Effects of Consumer's Value. Journal of Distribution Science, 10(1), 33-42. Oliver, R. L. (1980). A Cognitive Model of Antecedents and Consequences of Satisfaction Decisions. Journal of Marketing Research, 17(Nov.), 460-469. Ryu, Eun-Jung(2002). A Study on the Effect of Clothing Consumption Value on Service Quality of Internet Apparel Shopping Mall. Journal of the Korean Society of Costome, 52(3), 161-169. Sheth, J. D., Newman, B. I., & Gross, B. L. (1991). Why We WhatWe Buy: A Theory of Consumption Values. Journal of Business Research, 22(2), 159-170. Walsh, G., Hennig-Thurau, T., Sassenberg, K., & Bornemann, D. (2010). Does Relationship Quality Matter in E-services? A Comparison of Online and Offline Retailing. Journal of Retailing and Consumer Services, 17, 130-142. Westbrook, R. A., & Reilly, M. D. (1983).Value-percept disparity: An alternative to the disconfirmation of expectations theory of consumer satisfaction. In Richard P. Bagozzi, & Alice M. Tybout (Eds. ), Advances in consumer research, 10. (pp.256–261), Ann Abor MI : Association for Consumer Research. Yang, Seung-Kwon, & Shim, Jae-Hyun(2013). The Effects of Consumption Values on Customer Satisfaction and Behavior Intention in Fast-Food Restaurants. Journal of Distribution Science, 11(2), 35-44. Yu, Jong-Pil, & Yoon, Nam-Soo(2011). The Market Segmentation of Coffee Shops and the Difference Analysis of Consumer Behavior: A Case based on Caffe Bene. Journal of Distribution Science, 9(4), 5-13.